This is a special order item meaning it can take a little longer to arrive with us anything from 1-2 days to 30 days, please contact us if you would like an excat delivey date. Otherwise we will order and dispatch the helmet as soon as possable. This new RX-7V is considered a true limited edition that is only available for pre-ordering. 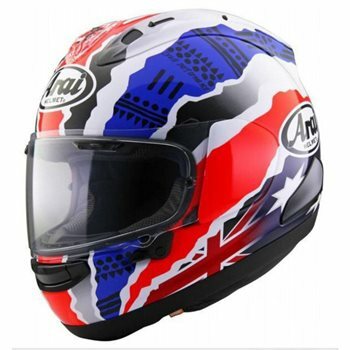 The RX-7V Doohan Jubilee design is a timeless legend that has been a favourite of riders for many years now. It is a celebration of our racing heritage that we can bring the design to life on our new RX-7V, giving a look that takes you back to the great 2-stroke 500cc Grand Prix days but with modern levels of safety. The best helmet, in the best painting!